That was one of the mantras of my late great grandma. At 102 years old and living alone in her own apartment, she had tripped on a door threshold when she was bringing her recycling to the Senior Housing recycling area. A broken hip and her relocating to a nursing home were the consequences of her practicing her own wisdom. She was able to share her elder wisdom for another two years before she died. I would love to see a bold, colorful poster with Grandma’s phrase. Designed like those classic WWII “Buy Liberty Bonds” posters, the “Use it Up” posters would be particularly fitting for these times when frugality has become trendy and hopefully a good habit. In my world every school classroom, post office and church would be encouraged to show the poster. Last fall, when I backpacked the Lake Superior Hiking Trail, time and time again I was reminded of Grandma’s words. My old Vasque hiking boots were wearing out. The lugs on the soles of the boots were beginning to resemble stream-smoothed stones rather than a sharp-edged waffle and I found myself a tentative hiker when I encountered steep sections, particularly going downhill on smooth rock. Clearly it was time to retire the boots. Just as one can measure their life by the collection of dogs they have frolicked with, good boots can also firmly hold our heartstrings. I recall a favorite pair of eight-inch Red Wing leather boots that I wore for several years. They were so comfortable that towards their last years, they felt almost like slippers. Eventually the leather covering my toes was compromised and began to wear through. I anguished over the simple act of throwing them away. . . . so I didn’t. I carefully cut the soles away from the leather and then cut the shoe area of the boots away from the upper portions of the boot that wrapped around my ankle. With the help of some brass rivets, I closed that opening. I loosened up the bootlaces and slipped the retrofitted boot over the head of one my axes and I now had a stout leather axe sheath. I did the same with the remaining boot and have tucked that piece in some shop drawer for future use. Even the handle of the axe has been a poster child for the “Use it up and Make it Do Campaign.” When the handle of the axe started showing some tough wear near the point where the axe head and handle are married together, I beefed it up with some sheet metal and duct tape. After a decade of hugging and protecting my feet up and down rugged trails around Lake Superior, climbing various summits in the Yukon Territory in Canada, even slogging through across rivers and through North Dakota sloughs in pursuing pheasants, it was clear that something has to wear out. The vibram soles were wearing away while the upper leather portions were still in pretty good shape as I have oiled them on a regular basis to keep them in good shape. This pair of companionable boots has been like a good dependable and reliable friend. I could hardly bear to say goodbye to them. So I didn’t. 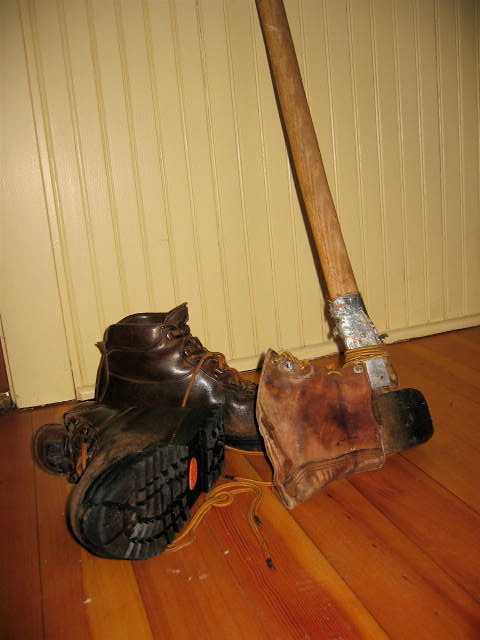 I found a cobbler who specializes in repairing and resoling hiking boots. And rather than spend nearly $200 dollars to replace the old Vasques with new leather ones, I would spend $60 to have the old soles removed and new ones stitched on the boots that have had a decade to form to only my pair of feet. Had I bought a new pair of Vasque hiking boots, I would have had to hike miles, maybe days in them for them to accept and shape themselves around my feet. So when the mailman delivered the box housing my companionable old boots, I was like a Christmas morning boy in tearing the box open. There nestled in a blanket of white tissue were the “new” boots. Why the cobbler had even oiled them and threw in a pair of good laces. Like a homesick salmon, the boots had returned to our old porch. Of course, the makeover boots fit like a glove with no breaking-in period required. With the boots laced snugly onto my feet, I stepped outside confidently on to the partially ice-covered sidewalk. Stepping onto a canvas of new snowfall, my print was bold and sharply defined. Every lug print of the boot sole was crisp. This was the print of virgin vibram. Giddy with this gift of resurrected boots and a nearby trail meandering through the woods behind our house, I found myself heading into the woods. And suddenly I pulled up a stanza of Robert Frost poem from my memory bank. With the perfect boots for me to keep.